Flossing your teeth can be a pain, especially when you consider all the steps involved in the process. After pulling out the floss and wrapping it painfully tight around your fingers, you then have to shove it between your teeth and floss away. By the end, you’re bleeding and frustrated, likely wondering why dentists are so keen to push flossing on everyone. Water flossers eliminate the complicated, and often painful, experience of flossing. These products wash away hard-to-reach food particles from between your teeth with a high-pressure stream of water. They offer versatility in the way you floss with different pressure settings and tip options, so you can get the most comfortable flossing experience. Our team has put together a list of the best water flossers you can get your hands—or teeth—on today. Check out our buying guide and associated reviews to learn everything you need to know about water flossers before you get to cleaning those pearly whites. Read more about our methodology. The h2ofloss hf-8 water flosser is a versatile and powerful model that can help you clean your teeth of all the leftover food particles you may have hanging around at the end of the day. With a waterproof design and a good variety of interchangeable tips, this water flosser is an outstanding choice for anyone looking to purchase a water flosser. Waterpik is a tried and trusted brand in the water flosser world, and the Waterpik WP-660 lives up to those same standards. With a huge variety of tip options and water pressure settings, you can customize your water flossing experience any way you like it. This model is compact as well, making it the perfect choice for someone who wants reliability without taking up too much counter space. The h2ofloss is a portable water flosser that operates off battery power to deliver a powerful and in-depth dental care experience. With a wide variety of water pressure settings and nozzle tip options, this water flosser is versatile and adjustable so you can get the best clean specifically for your teeth. It also carries an affordable price, making this a perfect choice for those on a budget. The Interplak by Conair features several different modes of operation, along with a good variety of water pressure settings and tip options. This versatile water flosser works great for someone on a budget who still wants a reliable brand. This water flosser also features a sturdy design with a long water hose for greater mobility. The Lavany Oral Irrigator offers a ton of userful features ranging from a cleanliness-focused UV light that sterilizes your nozzle tips to a high-volume water reservoir for longer flossing sessions. These features make the Lavany Oral Irrigator a great choice for someone looking at purchasing a countertop water flosser. The NiceFeel Water Flosser has an extra-large water reservoir so you can spend longer flossing your teeth during those times when leftover food refuses to be cleaned away. This water flosser also provides a g ood number of nozzle tips and water pressure settings for greater flexibility in choosing how you want to use your water flosser. The QQCute Portable Oral Irrigator is a cordless water flosser made for portability without sacrificing power and usability. 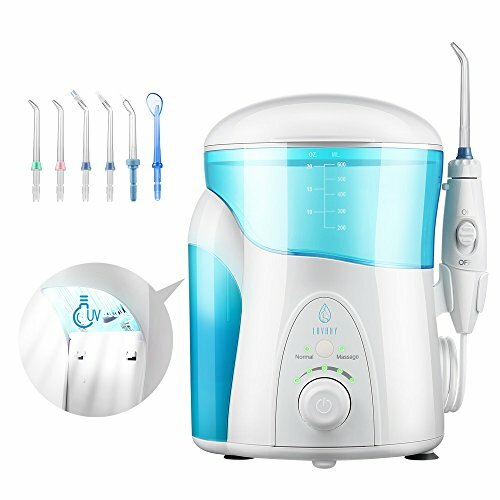 This water flosser features one-touch controls and a large water reservoir that makes it incredibly easy to use and maintain. You can also rely on its three different flossing modes to get any stubborn food left stuck inbetween your teeth. The SmarToiletries Cordless Professional water flosser is a great option for anyone looking for a waterproof water flosser that they can take along with them on trips out of the house. 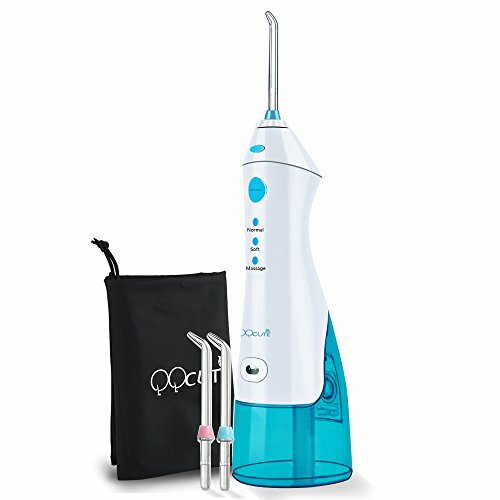 While it only includes two nozzle tips, this cordless water flosser is easy to use and maintain with simple button controls and a removable water reservoir. The Waterpik WP-950 brings the reliability of the Waterpik brand to the table, along with a myriad of features and accessories that help you customize the way you brush and floss your teeth. With a good number of nozzle tips and toothbrush heads, this combination water flosser allows you to both brush and floss your teeth using the same device. This flexibility is incredibly handy for people who want a comprehensive dental care plan. When you think about water flossers, you should be thinking about water pressure first. To clean your teeth, water flossers shoot a pressurized stream of water in hard-to-reach areas in your mouth. However, some people find higher pressure settings painful, while others absolutely need those higher pressures to achieve their desired cleanliness. The more water pressure options you have available to you, the more versatile you can be with water flossing your teeth. This is also important if you’ve never used a water flosser before. Beginners may find higher pressures to be uncomfortable, and they often need to start at lower pressures and work their way up. Since water flossers use water, most options include some kind of water reservoir built directly into the unit. These reservoirs can range in size, with large tanks lasting up to 2 minutes of flossing time. Consider the amount of time you usually spend flossing. Having a large water reservoir will prevent you from constantly needing to stop flossing and refill. Remember, portable water flossers typically have much smaller water reservoirs and need to be refilled much more often than countertop or combination water flossers. Water flossers use a variety of different tips for different purposes. If you have a completely healthy and average set of teeth, you may not need a huge variety of tip options. However, if you have braces or dental implants or if multiple people in your home are using the same unit, you’ll definitely need to get a water flossers that offers a wide variety of tips. Countertop water flossers are semi-permanent fixtures on your bathroom countertop. Portable water flossers are often used in public. Because of these scenarios, it’s important to consider the design and size of the water flosser you purchase. Units with large water reservoirs tend to be bulkier, in both countertop and portable units. Some are designed to look like high-end appliances. If you don’t have a lot of space, you may need to consider purchasing a portable or extra-compact unit. For under $30, you can buy a budget water flosser. These water flossers are perfect for people who don’t have a lot of space or who are always on the go. They typically only offer around three pressure settings and small water reservoirs. In the $30-$50 range, you can get a water flosser that fits most people’s needs. These units are typically countertop models and offer standard features along with extra tip and water pressure options. For more than $50, you can buy a premium water flossers. These models offer extra features like larger water reservoir and more pressure settings. You’ll likely stay in this price range if you consider combination water flossers. 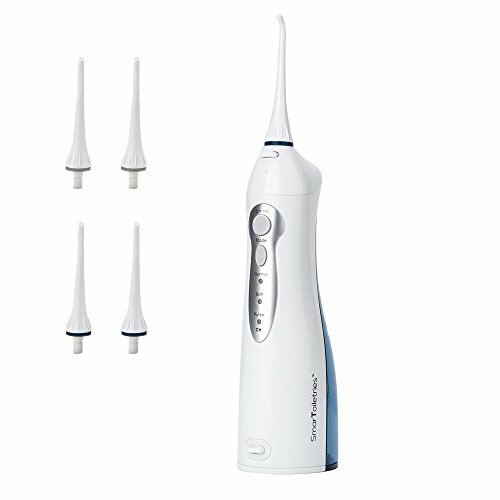 The h2ofloss hf-8 is a versatile water flosser that offers a broad range of helpful features and settings. With five water pressure settings and a huge number of interchangeable tips, this water flosser is one of the most flexible options we reviewed. This water flosser also has an impressively large water reservoir and is completely waterproof, making it longer lasting than many of the other water flossers. These features and more are why the h20floss hf-8 is ReviewLab’s top pick. Extremely quiet operation. The h2ofloss hf-8 water flosser is extremely quiet during operation, registering around only about 50 decibels of noise when powered on. Many users report being surprised at how quiet the water flosser operates. Having a water flosser with such quiet operation makes using this model more comfortable than other water flossers. Large water reservoir. This water flosser beats out most of the competition with a high-capacity water reservoir of 800 milliliters. Users report that this water reservoir lasts up to three minutes of continuous use. This amount of time allows you to more completely clean your teeth. Plenty of tips and water pressure settings. With 12 tips, including a nasal spray tip, and five different water pressure settings, the h20floss hf-8 provides a comprehensive dental care solution. Four of those tips are the standard jet tips marked with different colors so up to four different people can safely use the water flosser without having to worry about mixing up tips and risking cross contamination. In fact, many users report purchasing this model because they have multiple people who want to use it. Completely waterproof. The h2oflosser hf-8 carries an IPX7 waterproof rating, meaning it can be fully submerged in water up to a depth of one meter and for up to 30 minutes without ruining it. Many users have gotten this model completely wet and still been able to use it after without any problems. The switch on the handle is hard to operate. Many users report having trouble operating the power switch on the handle of this water flosser, stating that they have to use two hands to do so. The Waterpik WP-660 is a reliable and easy-to-use water flosser that features a wide variety of tips and water pressure settings. The abundance of settings this water flosser provides you a greater level of flexibility on how you personalize your oral health care. You can also expect a minimal footprint in your bathroom with how compact this model is. All these features and more make this water flosser an easy choice for ReviewLab’s runner-up top pick. High number of settings and tips. The Waterpik WP-660 features a high number of settings and tips that you can use to customize your water flossing experience. With over 10 water pressure settings, you can adjust this water flosser to clean your teeth as lightly or heavily as desired. The unit also features seven different tips, include three general use tips, one toothbrush tip, one “Plaque Seeker” tip for hard-to-reach areas, one orthodontic tip and one “Pik Pocket” tip for delivering medication and rinsing below your gumline. Many users are most pleased with the high number of options available with the Waterpik WP-660. Two different flossing modes. You can choose between two different flossing modes with this water flosser. The first mode, called “Floss Mode,” is the standard water flossing mode. The second, called “Hydro-Pulse Massage Mode,” is intended for gum simulation and improved circulation to promote healthy gums. Many users report liking the Hydro-Pulse massage mode most, stating that it helps their gums feel healthier overall. Incredibly easy to use. The Waterpik WP-660’s design features simple and clear buttons and dials for both powering on the unit and adjusting water pressure settings. You can also easily switch between different flossing modes with the push of a button. These features make this water flosser one of the easier models on the market to operate. Most users who reviewed this product report finding the Waterpik WP-660 incredibly easy to use. Compact. This water flosser is small and compact, leaving a very small footprint in your bathroom. Measuring in at only a little under 5 inches wide and 10 inches tall, the Waterpik WP-660 is one of the smaller countertop water flossers on the market, all without sacrificing functionality. Many users are pleased with how little space this water flosser takes. Covered water reservoir and tip storage. Both the 650-milliliter water reservoir and tip storage are covered, which improves the overall sanitary operation of this water flosser. With a covered water reservoir and tip storage, you can avoid unhealthy situations with mold and other contaminants infecting your Waterpik, which many users appreciate. Not waterproof. The Waterpik WP-660 is not waterproof, meaning you’ll need to be more careful not to get it wet while using it. The h2ofloss hf-3 Premium water flosser is portable, reliable and powerful enough to keep up with larger water flossers. Six water pressure settings and five different tips are among the many featuers that make this water flosser a great pick for anyone looking for a budget option that is also easy to carry around and powerful enough to give them a comprehensive flossing experience. For these reasons, the h2ofloss hf-3 Premium is ReviewLab’s best value pick. Extra portable. The h2ofloss hf-3 Premium water flosser is designed with portability in mind. From its compact size of 4.7 inches long and 3 inches wide to its battery-powered setup, this water flosser is easy to take anywhere. Many users rave about how light and compact this unit is, which it makes it perfect for them to take in their travel bags. High capacity despite smaller size. This portable water flosser features a 300-milliliter water reservoir, which is large for such a small unit. With this kind of reservoir, you can expect to get about a minute’s worth of operation out of the water flosser. Users report being pleased with how long they can use the hf-3 Premium, especially for how small the unit is. 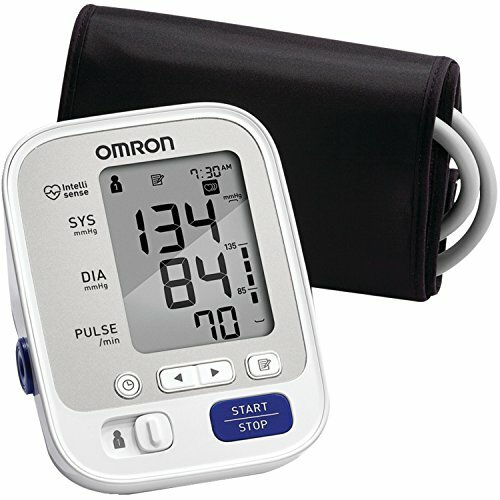 A good number of tips and pressure settings. The h2ofloss hf-3 Premium water flosser offers six different water pressure settings—including a pause setting—along with five different tips for more flossing options. Many users are happy to be able to get a comprehensive clean with this number of settings, even while on the go. Included carrying case. Whether you use this at home or on the go, the h2ofloss hf-3 Premium includes a convenient carrying case that both safely stores and protects the unit along with its included accessories. Many users are happy with the case, saying it was just as compact as the water flosser itself. Loud operation. This water flosser runs loud, according to many of the users who have purchased and use it regularly. The Interplak by Conair water flosser is a light and portable countertop option for anyone who wants a variety of water pressure settings and nozzle tips. With a long water hose and sturdy design, this water flosser makes a great choice for anyone who needs a reliable oral care solution on a budget. If you’re looking for a water flosser that you can also use to brush your teeth and massage your gums, then look no further than the Interplak by Conair. Three-in-one functionality. 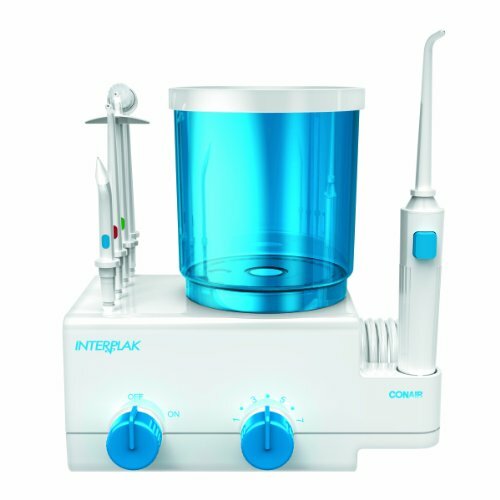 The Interplak by Conair water flosser offers a unique three-in-one functionality by including a toothbrush tip, flossing tips and a subgingival tip. This comprehensive water flossing solution helps you take better care of your teeth with a single product. Many users report being happy about the variety in choices of functional tips. More pressure settings than most. This water flosser provides seven different water pressure settings for greater versatility on how thoroughly you floss your teeth. Many smaller units don’t offer nearly as many pressure settings, and users are pleased with the added flexibility. Long water hose. The Interplak by Conair water flosser features a water hose that is three feet long. Many users are surprised at having so much slack when using the unit. They report having plenty of room to move around their bathroom and maneuver the nozzle in any way they please during use. No pause option. You cannot pause the Interplak by Conair water flosser. You can only turn the unit on or off. 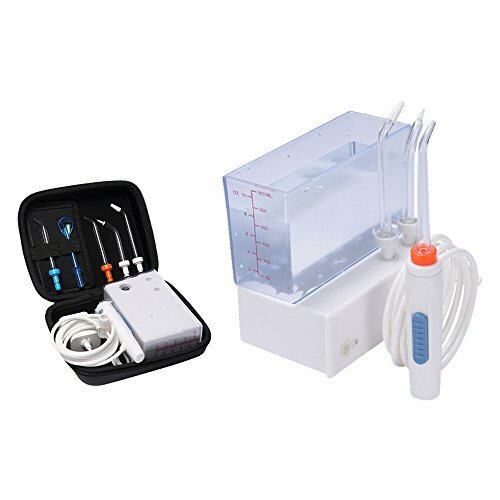 The Lavany Oral Irrigator is a unique water flosser that features an incredibly sanitary feature in the UV light on the tip storage container. It also features a variety of other helpful features like a high number of water pressure settings and nozzle tips, along with a high-volume water reservoir. These features make the Lavany Oral Irrigator a great choice for anyone looking to buy a reliable countertop water flosser. Includes a UV sanitizer. 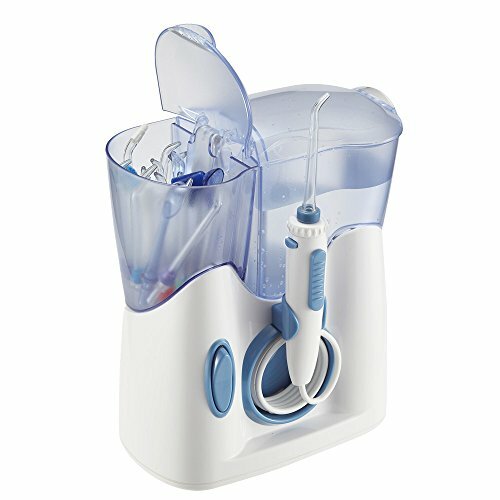 The Lavany Oral Irrigator is a water flosser that offers a unique and incredibly healthy feature. The water flosser features a tip storage container that sits under a UV sanitizer. This sanitizer kills 99.9% of bacteria on your tips, so you don’t have to worry about constantly cleaning them. Many users report feeling much more confident about the overall cleanliness of the model with this feature. Huge number of water pressure settings. With 10 different water pressure settings, the Lavany Oral Irrigator gives you the flexibility to floss your teeth with as much or as little pressure as you desire. This is crucially important if you have multiple users using the device at the same time. The easy-to-use dial makes changing water pressure settings a breeze for both small and large hands, according to many users. High-volume water reservoir. This water flosser features a high-volume, 600-milliliter water reservoir that provides up to a minute and a half of operation, according to many users. With such a high-volume water capacity, you can be sure you get a comprehensive and complete dental cleaning when you use this water flosser. Splash proof. The Lavany Oral Irrigator also features a IPX6 waterproof rating. While this doesn’t mean that you can completely submerge the model without problems, it can be splashed with water and not be ruined. This design also contains an internal valve that prevents water from leaking out of the unit. Loud operation. Many users report that the Lavany Oral Irrigator operates loudly, which can be annoying when using it early in the morning or late at night. The NiceFeel Water Flosser is a power and high-capacity unit that gives you more flexibility in the way that you can floss and clean your teeth. With a large water reservoir that can deliver more usage time than most models on the market, you can be sure to receive a comprehensive clean every time you use the NiceFeel Water Flosser. You also get more tips and water pressure settings, making this a flexible and versatile countertop water flosser. Incredibly high-volume water reservoir. 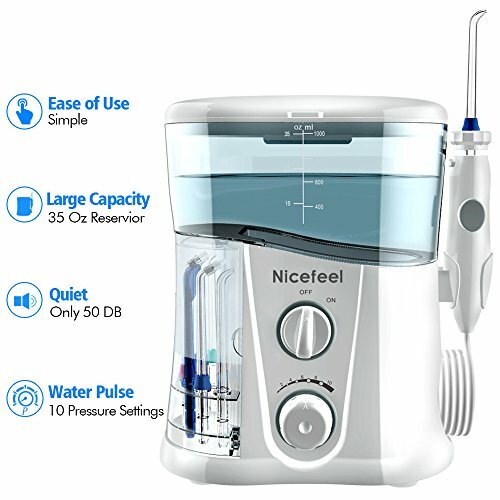 The NiceFeel Water Flosser features an incredibly high-volume water reservoir, higher than most other models on the market. This 350-milliliter water reservoir can provide up to two continuous minutes of use, according to many users. With a longer running time, you can be sure to get a comprehensive clean from this water flosser. All-in-one functionality. This water flosser offers all-in-one functionality with the included nozzle tips. The seven nozzle tips include a tongue cleaning tip, a periodontal tip and a dental plaque tip, among others. Many users are pleased with the number of tips available to them. This unit also features three of the same normal nozzle tips with different colored markings so more than one person can use the device. 360-degree water nozzle. The NiceFeel Water Flosser also features a water nozzle that can rotate a full 360 degrees. Users are very pleased with this feature, stating that it helps them cover and clean hard-to-reach areas. The nozzle is also easy to rotate, using the simple rotation knob on the nozzle. Plenty of water pressure settings. With 10 water pressure settings, you can greatly customize the way you use this water flosser. With this high number of water pressure settings, you can feel confident knowing that both beginners and advanced users can easily use the NiceFeel Water Flosser. Short water hose. Some users report that they wish the water hose was longer so they would have more wiggle room while using the unit. The QQCute Portable Oral Irrigator is an incredibly compact and portable cordless water flosser that gives you enough features to clean your teeth well while you’re traveling or away from home. With three different flossing methods and a fairly large water reservoir, you can clean your teeth with ease and comfort, depending on how much leftover food you may have left in your mouth. The unit also features one-touch controls that make it even easier to operate. Extremely portable. The QQCute Portable Oral Irrigator is extremely portable, which is one of the best reasons to buy a cordless water flosser. Many users report being able to use this water flosser in one hand without having to fumble with water hoses or power cords. It can also easily fit into travel bags and purses for easier transportation with the included carrying ase. Three different flossing modes. This cordless water flosser features three different flossing mode: Normal, Soft and Pulse. Each of these modes provides a different level of water pressure so you can customize how want to clean your teeth. Many users find the three modes sufficient enough to clean their teeth while they are out and about. One-touch controls. You won’t have to worry about fiddling with dials switches with the QQcute Portable Oral Irrigator. Instead, you simply press one of two buttons to power on/off the device, change flossing modes or release the nozzle tip. This makes the unit even easier to use while on the go. Large water reservoir. While this cordless water flosser’s water reservoir isn’t nearly as large as the countertop units, it still boasts an impressive 220-milliliter water storage. Some users report this amount being just enough to get a quick clean of all your teeth without needing to fill up the reservoir. Only two included tips. The QQcute Portable Oral Irrigator only includes two standard flossing tips. The SmarToiletries Cordless Professional water flosser is a protable and compact option that features multiple nozzle tips, a waterproof design and a removable water reservoir. These features allow you to comfortably travel with this cordless water flosser without having to worry too much about it wearing out or not being able to use it for what you need. This water flosser is perfect for something looking to bring a comprehensive solution with them while traveling. High number of tips included. The SmarToiletries Cordless Professional water flosser includes four jet tips. While these tips are all the same standard size, they allow you more flexibility when traveling, especially if you lose a tip or get one dirty. This is also helpful if you have more than one person using the device. Each person can get their own tip. Waterproof design. This cordless water flosser is completely waterproof, and you can use it in the shower, if desired. This waterproof rating also helps protect your device against accidental spills and splashes while you’re traveling, making it a unit that lasts much longer than many other portable water flossers. Users are happy with the waterproof design mostly for the added protection. Removable water reservoir. The 150-milliliter water reservoir featured on the SmarToiletries Cordless Professional water flosser lasts up to 45 seconds of continuous use, according to many users. This water reservoir is also completely removable, which helps you clean the unit when needed. Automatic shut off timer. With an automatic two-minute shutoff timer, you can be sure to preserve the lithium-ion battery of the SmarToiletries Cordless Professional water flosser. After two minutes of being powered on, the unit will shut down on its own so it’s not wasting battery power. Many users appreciate this feature, because it’s easy to forget to completely power down the device after use. Doesn’t include a carrying case. The SmarToiletries Cordless Professional water flosser doesn’t include a carrying case with the original unit, although you can purchase one after the fact. 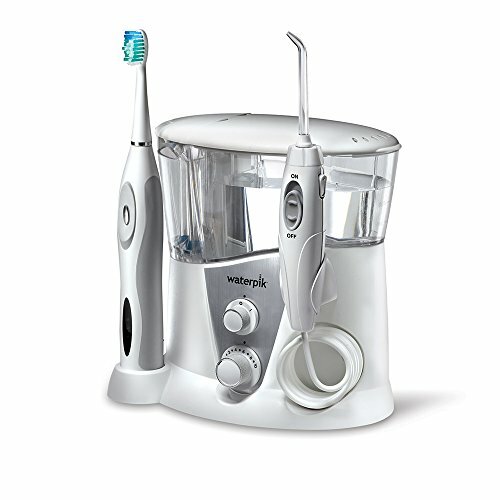 The Waterpik WP-950 is a combination water flosser that features both a sonic toothbrush and a water flosser in a single unit. This dual-use functionality gives you greater control over your dental care and oral health. It also features a convenient tip storage container and a high number of water pressure settings so you can customize your flossing experience ever more. While this takes up a little more real estate than traditional water flossers, it saves you space by only having one unit for all your dental care needs. Dual-use functionality. 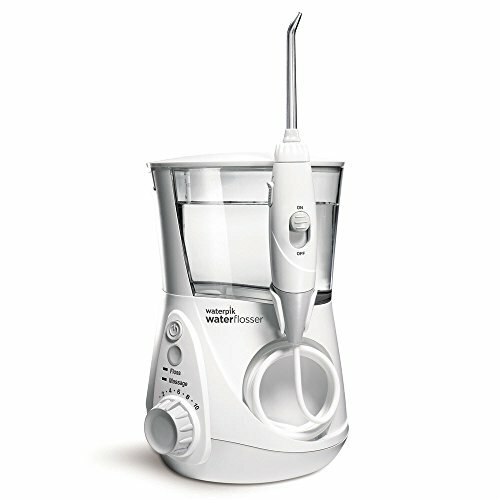 The Waterpik Wp-950 features both a water flosser attachment and a sonic toothbrush attachment. This dual-use functionality makes this a more comprehensive dental care solution than any of the other water flossers reviewed on this list. You an brush and floss your teeth using a single device, without having to worry about taking up too much space in your bathroom. In fact, this dual-use functionality is one of the top reasons users purchase this model. Organized tip storage. This combination water flosser includes an easy-to-access tip storage compartment that you can use to both store and organize your water flossers nozzle tips. It also includes a hard carrying case for the toothbrush heads. Having tip storage like this has kept many users’ tips and toothbrush heads clean and sanitary throughout the life of the product. High number of pressure settings. With ten water pressure settings, you can easily customize the way you want to brush and floss your teeth. If you know you’re going to want to floss harder one, you can simply set the pressure higher and plan on brushing lighter, and vice versa. Many users have easily been able to find the right pressure setting for them in this lineup. Plenty of extra nozzle tips. The Waterpik WP-950 includes five separate nozzle tips that you can use interchangeably: two jet tips, a high-intensity plaque seeker tip, an orthodontic tip and a “Pik Pocket” tip that helps treat pockets in your gums. Users report enjoying the number of options they have available to them with this water flosser. Too loud. Many users report that both the toothbrush and water flosser functions operate loud, making it hard to use during early morning hours or late at night for fear of waking up surrounding people.